It's been twenty-one years since Gotthard released their live acoustic album 'D-frosted', the record that really set Switzerland's finest on the road to superstardom. It was inevitable that a sequel would appear at some point and this latest offering was recorded on the band's acoustic tour in March this year. With another nine studio albums since the original's release, including three with vocalist Nic Maeder, who joined following the tragic death of Steve Lee (I can't believe it's been eight years! ), they have a wealth of material to choose from; 'Defrosted 2' certainly leans closely to the Maeder-fronted songs, but intersperses them with some of their more "classic" numbers. Augmented by their regular keyboardist Ernesto Ghezzi, a string quartet, percussionist and two female backing singers (who also contribute occasional lead vocals), the overall sound is naturally lush for a live record which makes this a more than worthy follow-up. The album kicks off with 'Miss Me', a moody number from their most recent 'Silver' album, and the band follow it up with 'Out On My Own' from the original 'D-Frosted' release. 'Bang' and 'Sweet Little Rock 'N' Roller' inject some pace into proceedings, then 'Beautiful' is slowed right down and completely unrecognisable from the 'Silver' version. However, I think it's only when the salvo of 'Feel What I Feel', 'Hush', 'Remember It's Me' and 'Stay With Me' arrive that the performance really kicks into gear. From there on, it's a wonderful blend of oldies and newies; 'Tequila Symphony' works brilliantly in its acoustic guise, the Folk-tinged 'C'est La Vie' is beautiful, 'Tell Me' is livened up from the slow, acoustic original and 'Starlight' sneaks in some electric slide guitar. 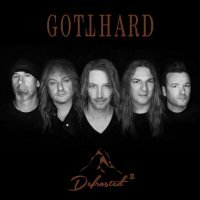 As for the oldies, 'Mountain Mama', 'One Life One Soul', 'Sister Moon' and 'Lift U Up' will always be welcome in any Gotthard set. The version of 'Heaven' found here is just sublime, while 'Anytime Anywhere' is very cleverly re-arranged to take advantage of the backing singers. The set finishes with a dramatic, acoustic cover of 'Smoke On The Water' that is just excellent. Two brand-new songs round out the package and they both keep the mostly-acoustic feel of the live material. First up is the bubbly, party-rocker 'Bye Bye Caroline' which is great, light-hearted fun; it also features Francis Rossi and was influenced by Status Quo's own 'Caroline'. The second new track and album closer, 'What I Wouldn't Give', is a very stylish and emotional ballad that perfectly complements the sophisticated arrangements of the rest of the release. I only have one complaint with 'Defrosted 2'; it's a real shame that they didn't go the whole hog and film it for a live DVD release too.